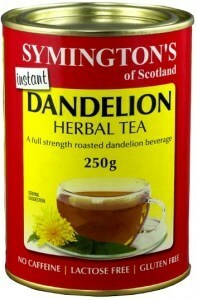 Symington's Instant Dandelion Herbal Tea is a granulated form of Roasted Dandelion root . It has a very pleasant taste, quick to prepare and does not require a long boiling of the roasted root as is required by conventional ungranulated roasted root to extract the valuable soluble solids of Dandelion. It is an ideal caffeine free alternative beverage.. We recommend Symington's Dandelion is drunk as a perfect drink before bed or during the day when you crave that cup of tea or coffee as it takes no longer to prepare than a normal cup of instant coffee. 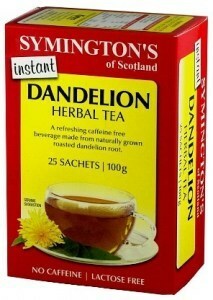 New stocks of this product are now LACTOSE FREE, the product has been reformulated using dextrose and glucose instead of lactose but the Strength of Soluble Dandelion root has not changed and so the quality and beneficial effects of drinking Symington's remain the same with only a small change to taste and therefore those who are Lactose intolerant can also enjoy the benefits of drinking Symington's Dandelion as well. (Vegetarian and Vegan ).